NEW YORK — By the end of this week, at least a dozen big league pitchers will have padded caps to try out as Major League Baseball looks into ways to improve protection against head injuries from line drives, according to a protective equipment manufacturer. Rob Vito, president of Pennsylvania-based Unequal Technologies Co., said MLB has examined caps containing Unequal’s CRT padding and requested and received modifications, as well as the results of laboratory testing. Vito said he’s encouraged by his communications with MLB and is now sending caps lined with the padding to pitchers for their examination and experimentation. Unequal Technologies Unequal Technologies’ prototype MLB cap, with its “CRT” padding sewn in. The padding can help reduce the severity of a pitcher’s head injury from a batted ball, the manufacturer’s president says. “We help reduce the possibility of head injury and its severity,” said Vito, adding that although the CRT name comes from “concussion reduction technology,” Unequal doesn’t purport to prevent concussions with its padding. 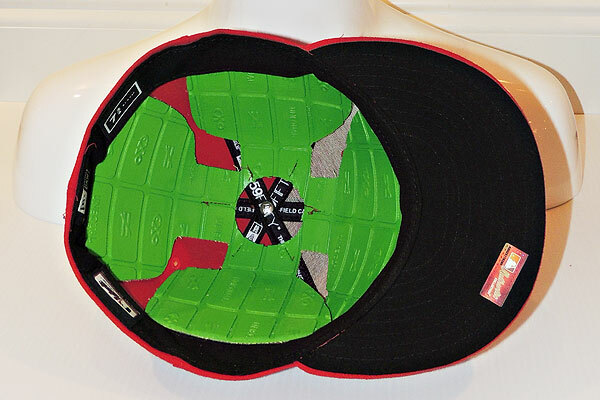 Its padding also is used to line helmets for baseball, football, hockey, lacrosse and other sports. Vito said Unequal’s padding for each cap weighs 4.3 ounces, is one-eighth of an inch thick and is made of a three-layer synthetic composite that includes military-grade DuPont Kevlar and a polymer with the properties of rubber. He also said Unequal could mass-produce the cap padding and sell it as an insert for about $60 apiece retail. Unequal isn’t alone in providing pitchers headgear for MLB’s consideration. MLB senior vice president Dan Halem said Monday that discussions are being held with Unequal and five other companies whose products are in different stages of development and use different materials. Among them is Georgia-based EvoShield, which submitted a prototype and is testing it, Halem said. Reached Monday, EvoShield director of product development Justin Niefer said his company’s “gel-to-shell technology” product for use in caps is one-quarter of an inch thick, weighs less than five ounces and conforms to the head for a comfortable fit. Niefer said the cap padding is undergoing two days of high-speed impact lab testing at Wayne State University in Detroit. Attention to the issue of pitchers’ safety heightened in the final two months of last season. In September, a line drive off the bat of the Angels’æErick Aybar struckæOakland Athletics pitcherBrandon McCarthy on the right side of the head, resulting in a skull fracture, brain contusion and epidural hemorrhage. Then in Game 2 of the World Series in San Francisco, Tigers pitcheræDoug Fister escaped injury when he was struck in the head byæGregor Blanco‘s line drive. According to Vito, three months before the McCarthy incident, New Era, the official cap maker of Major League Baseball, contacted Unequal about providing padded linings for pitchers’ caps. After Fister was hit, MLB’s Halem said that McCarthy’s injury “pushed up our timetable” and that padded caps could be introduced in the minor leagues as early as next season. Two weeks ago, MLB medical director Dr. Gary Green presented ideas and products to executives, team athletic trainers and doctors at the baseball winter meetings in Nashville, Tenn. Athletics head athletic trainer Nick Paparesta said that although head injuries suffered on a mound are rare, pitchers are vulnerable and some form of padding is worth a try. Even so, he doesn’t think it would have protected McCarthy. “In my opinion, where he was struck was just below the cap line,” Paparesta said. McCarthy underwent surgery and missed the last month of the season and postseason. Last week, he signed a two-year contract with theæArizona Diamondbacks as a free agent after receiving medical clearance to resume workouts and throwing. A padded cap wouldn’t have helped former Red Sox pitcheræBryce Florie, who in 2000 was struck in the face and right eye by aæRyan Thompson liner and suffered broken bones and retinal damage. Florie says he’d be in favor of a padded cap as a start and that his episode got him thinking about more drastic protection. “The day before I was hit, I’d say no way I’d want to wear a mask. The day after? Yes, I would’ve,” Florie said. Former major league manager Tony La Russa said a cap liner seems like a reasonable approach as long as expectations are also reasonable. NOCSAE announced it is introducing new standards next month for testing headgear, including face protection, for fielders in baseball and softball. Various youth leagues, slow-pitch softball and other organizations require pitchers and other fielders to wear protective headgear. Vito said Unequal’s padding for pitchers’ caps passed NOCSAE-standard testing last month at New York’s Intertek Lab. For Unequal, EvoShield and other companies, there are challenges beyond establishing to MLB’s satisfaction that the padded caps will improve safety for pitchers who’ve previously had just cotton between them and high-speed line drives in the direction of their head. For instance, nothing about a new lining can be cumbersome or disruptive to a pitcher’s routine movements. There also is the matter of style when it comes to the added substance. The difference in the cap has to be as imperceptible to everyone as possible or the men who would wear them might not be receptive to change.